Tyler armed with Vampire Killer and Dave wielding Alucard’s Spear venture forth on the most horrifying vampire hunt ever. Nah just kidding. 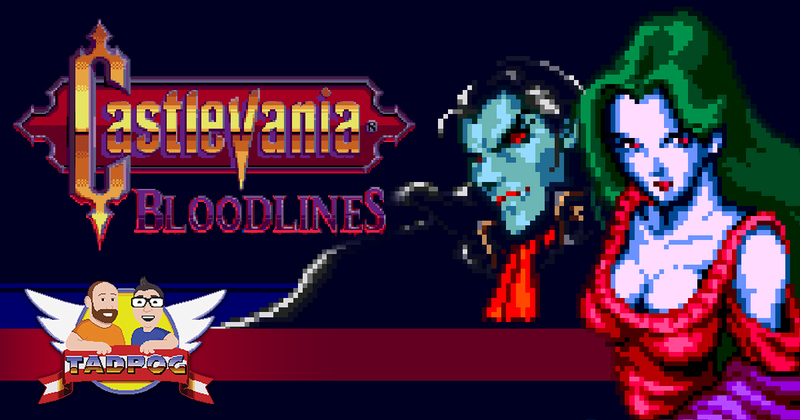 We just talk about Castlevania: Bloodlines, the 1994 action platformer for the Sega Genesis. It’s the only Castlevania game to appear on the Sega Genesis! Of course we also talk about Twilight and the sexiest verse to ever grace the pages of the Bible. Choco Chica also makes an apperance to administer a quiz that was written by Bovine Bear Matt Cowan. The Retro Video Game of the Month Club! Come by the Drunk Games Done Slowly Twitch channel on Thursday, August 23 2018. Dave will be playing Kabuki Quantum Fighter and Kung Fu to raise money for the World Wildlife Fund. Way back in 2014, we did an episode on Super Castlevania IV for the SNES. We’ve recently done a bunch of episodes on the Castlevania classics on the NES, games like Castlevania, Castlevania II: Simon’s Quest, and Castlevania III: Dracula’s Curse. There’s also an episode we did on Bloodstained: Curse of the Moon, a game that is Castlevania-adjacent. If you’re super supportive, generous and our best friend, you can listen to our Patreon bonus episode that we did on the first season of the Castlevania Netflix series. The Gear Steamer (the boss of level 7) totally looks like it belongs in Ballz 3D. Scott’s Tots, where Michael Scott is going to make our dreams come true! Nathan for You is pretty damn fantastic. Dr Feelgood, of Castlevania fame? Seven Brides of Dracula. Best witnessed in High School Theatre format.